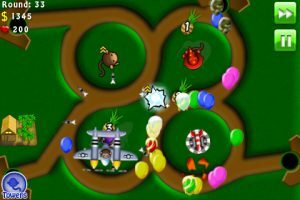 Online flash gamers and tower defense enthusiasts may have already heard of the Bloons franchise, but those who haven’t are in for a treat. The series of games by Digital Goldfish taps into the pure satisfaction born from popping balloons and runs with it with for every iteration of the Bloons family. 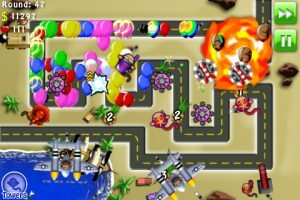 The latest addition to the bubble popping collection is Bloons Tower Defense 4 (aka TD4 for those familiar with the movement), and it’s wonderfully addictive. The game deploys a familiar lineup of colorful balloons (and balloons within balloons) and then gives you access to a whole series of monkey defenses that start with single monkeys shooting darts to boomerang throwers and dynamic rotating tower defenses. When you first start out you’re given a specific allotment of how many balloons can slip past your defenses before the game ends. It’s your job to make sure that each of the balloons gets popped before they make it through the maze and hit the other side, or else you’re diminishing your lifespan and risking termination. At first the task is simple (the creators even poke at themselves for how easy the first level is), but before long the levels turn dramatically more difficult. What first started as a brigade of red balloons becomes balloons embedded in balloons, and you must purchase defenses (with money that you’ve earned through achievements) in order to build up your balloon popping power. Part of the strategy is about properly managing your money and skill distributions, but there’s also an added strategy component that has everything to do with how you place your defenses. Those familiar with the Bloons franchise will be pleased to see new additions in the virtual store, including monkey planes and the addition of banana farms that grow money for you. If all these defense types and layered balloons sound confusing, it’s not. Every level has three difficulty levels, and the creators do a good job of introducing new features in small doses throughout the game. 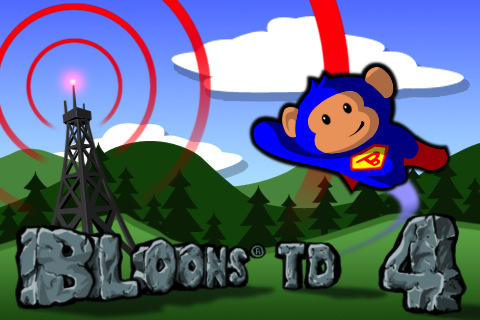 Expect to be playing Bloons TD4 within minutes, but still playing an hour later. In terms of replay value, Bloons TD4 does a great job. Once you’ve mastered a course you can replay the level in free-play mode to earn points, and managing your defenses has a kind of Sim-City feel where you’re in charge of keeping everything balanced and in order. All said and done, there are 75 rounds to beat along 15 different courses. Personally, it took me some time before I really understood why Bloons has such a devoted fan base, but by the time I unlocked a few of the more advanced courses and became obsessed with my earnings I finally understood. 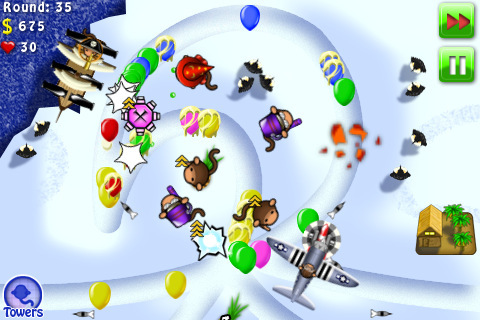 Bloons starts with the satisfaction of balloon popping, but is actually much more involved. There’s a whole world behind those lines of blue and red, and it’s easy to become absorbed. Bottom Line: Bloons TD4 is a charming and addictive bubble popping extravaganza that’s perfect for a light, easy going gaming experience.